I have held many titles in the tech industry: Engineer, Lead Engineer, Head of Engineering, VP of Engineering, and CTO. You would think that each of these titles would be self-explanatory, but as I’ve transitioned from one company to another, I’ve been surprised by how differently these roles are interpreted by different organizations. For example, when I was CTO at the startup Crowdcube Limited, I was still very much focused on building the actual engineering team and developing the product with my team. However, I noticed that other startup CTOs I spoke to performed roles that were closer to Lead Engineers or Technical Architects, while corporate CTOs tended to be executives with very little involvement in the actual product (to make things more confusing, some were even be given the title of EM—Engineering Manager). Having recently joined developer tools company Pusher as an “Engineering Manager,” I gladly took the opportunity to introduce myself to my team and explain what they could expect from me—and what value I intended to add to the business. I also shared what traits I thought a successful technical leader could—and should—bring to the table. What sets the top leaders apart from the other titles listed above and what responsibilities should be held by each? My conclusion was: it depends. Roles and their corresponding responsibilities depend on many different factors: the size of the company, the funding stage, the background of the founders, or current skill sets within the team. An EM’s primary concern and responsibility are to the individual. They are dealing with each member of the team on a personal level. They are in a unique position to understand the dynamic of the team, how it constantly evolves over time with new hires, changes in team structures, and varying degrees of pressure. They are ‘in the trenches’ and very much attached to day-to-day trials and tribulations. To extend this analogy, I would describe an EM as a Sergeant Major. They are very much part of the mission delivery team and manage a group of experts to perform specific tasks. 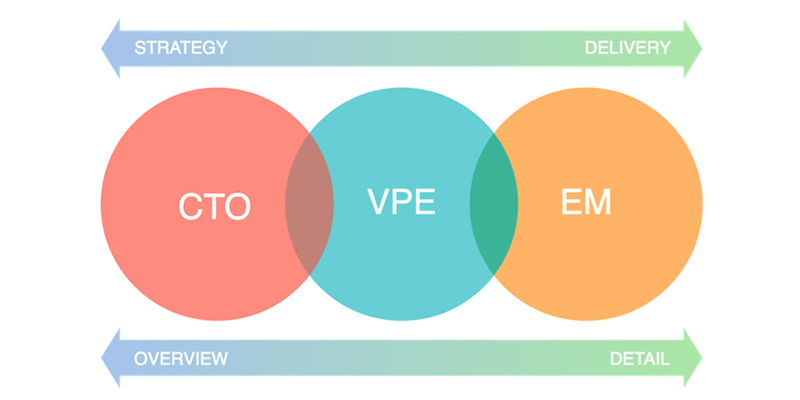 A CTO, or VPE (VP of Engineering), may well be more akin to a General: overseeing the situation from a vantage point that allows them a higher-level view although more detached from the immediate action. With dynamically changing information, the Sergeant Major will be continually tweaking and refining the approach while being in constant communication with their Sergeants (team leads) to ensure the successful delivery of the plan. The Generals know their desired outcome and retain their overall view of the entire situation but receive information at a much slower rate than the team on the ground and, therefore, cannot react as quickly to change. The EM is the interface between strategy and delivery. They will be working with the leadership team and translating directives to their team as actionable tasks and deliverables. This is very much a two-way relationship. A good leader will have their team’s best interests and wellbeing as a main concern and ensure that they are represented in the discussion back through the chain of command and used to influence decisions. The EM must be trusted by their team to represent them and work to protect them. To protect the team, the EM must provide a reasonable structure to allow engineers to focus on their goals. As liberating as it may seem to allow a team to run free and choose their own focus, there definitely need to be some boundaries to prevent the project going so far off piste that it loses all value. By having a strong, but gentle handle on the work, and an up-to-date understanding of the current status and morale of the team, they are able to course correct if necessary at an early enough stage that a minimal amount of change is required. I have certainly made the mistake of underestimating this need and proudly announcing, “fly my pretties, fly” to my team only to check on progress at some point and realize that some have struggled with no guidance which has had a negative impact on morale. More than anything, there needs to be a culture of emotional safety where the team is empowered to act bravely, make decisions, and try new things without being controlled by a fear of failure. We should be striving for excellence and this will only come as a result of moving out of our respective comfort zones. I imagine this to be like a bowling alley—some folks will bowl strikes and pick up spares all day long while others can lose sight of the goal and end up bowling gutter balls. This is demoralizing and results in a lack of delivery and results. The EM acts as the bumper rails—they allow everyone in the team to focus on the pins without the distraction of making the odd bad bowl. The engineers should be 100% focused on the goal, the EM is there to provide that safety layer that protects the team’s cognitive effort. The real skill of an EM is in identifying which members of the team work best with minimal interaction and which require much more structure and providing them with that level of service. With the relationships that have been built and nurtured within the team, the EM also provides great value to the Leadership Team. They implicitly understand the pain points being experienced by the team and should be regularly surfacing and communicating these issues. Engineering Managers are constantly in the position to identify high performers that need to be nurtured and lower performers that need assistance. Recruitment and capacity planning should start from this position. Not only when looking at bringing new talent into the team but more importantly, recognizing the unique career objectives along with how they can be accommodated and encouraged for each member of the team. Most importantly of all, the team needs to feel fully and unconditionally supported by the Engineering Manager. They are their safety layer. They provide guidance when there is uncertainty, and protection when there is a threat. This may sound dramatic, but changing scopes and shifting deadlines are a genuine threat to morale and therefore the productiveness of the team. The Engineering Manager is the provider of context when there are changes and the voice of reason when there is debate.